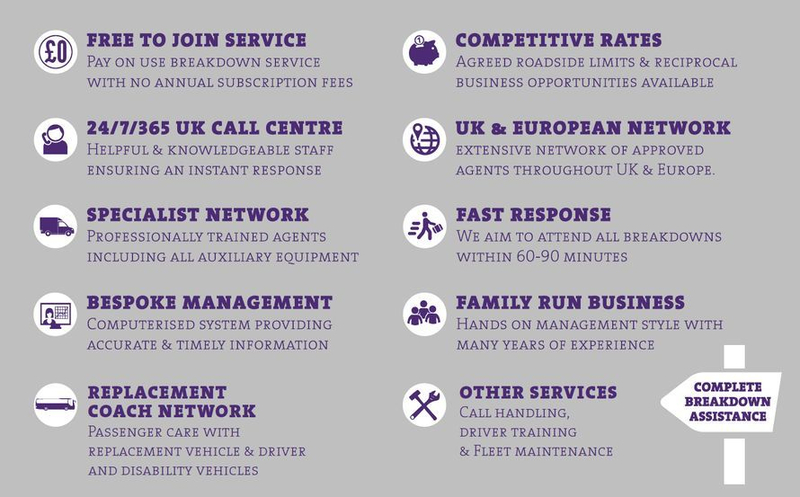 Nationwide Coach Assistance Ltd (NCA Ltd) was formed in 2002 to provide a unique pay on use service dedicated to the coach industry and is now established as a leading breakdown service provider. NCA Ltd, operates from our own call centre based in Denton, Manchester, and provides a “One Stop Shop” support service for any type, model or age of vehicle, including any ancillary equipment. The service includes roadside assistance and repairs ranging from minor failures to major RTA’s. All services are accessed using one phone number, 0161 336 9389 where helpful and knowledgeable staff are available 24hours a day 365 days of the year, who will mobilise the nearest most competent agent to attend to your situation. The target is to be in attendance within 60/90 minutes. The first and foremost consideration is to get the vehicle mobile again safely, in the shortest possible time. If the roadside repair exceeds a previously agreed roadside cost limit, contact is made for authorisation to continue. In recovery situations, quotations can be obtained prior to commencement and the operator makes the decision. If the vehicle cannot be repaired a replacement coach with driver can be arranged subject to availability to allow passengers to continue with the journey. Coverage is throughout the UK and Europe, and it is our agents who determine our reputation. Therefore we only use those who respond quickly and produce quality workmanship. They are all experts in their field and approved by NCA Ltd. With an extensive network of specialist agents, including main dealers and independents, plus coach operators, we are well placed to provide an efficient response to any situation anywhere and anytime delivering an unrivalled level of service you would expect when in need of a urgent roadside assistance, and at competitive rates. Reciprocal business opportunities play a major part in our support package, not only with the roadside repairs, but our replacement coach service. Our large database of operators, who have accounts and agreements with NCA, gives us the opportunity to source replacement coaches when available from those who have capacity to assist their fellow operators. Using the coach industry to support fellow operators, who have a common understanding of all requirements, provides not only confidence of service, but business benefits too. An important point to note is that NCA guarantees full payment to the coach service provider. Knowledge of the industry is a key factor in the considerable success of NCA Ltd, coupled with access to an extensive network of approved agents. We strongly believe in and apply a “hands on” style of management, which enables a consistent delivery of a helpful quality response with effective communications to operators in trouble, assisting them to protect their reputations and commitments. NCA have been the official CPT breakdown support partner for over 10 years with a dedicated members contact number for the CPT Assistance breakdown scheme when in need of assistance in a breakdown situation. We pride ourselves in assisting coach operators to protect reputations and commitments to their customers in any breakdown situation. NCA Ltd also has access to a network of approved training providers to assist operators to source the best solution for their training requirements including DCPC. NCA booking facility offers a 24/7 helpline NCA offers a FREE professional service to all operators. NCA Ltd have been a CPT Commercial Partner for over 10 years providing breakdown assistance throughout the UK and Europe 24 hours a day. CPT members receive a discounted labour rate. When replacement vehicles are required contact is made with CPT members first for assistance.